(Bali, 2018) Celebrate the holy Nyepi day – the day of silence – at Samabe Bali Suites & Villas, because it is a unique day to be celebrated, something that cannot be found anywhere else in the world. After whole year filled with a hustle bustle of city, glittering of lights and sounds, and now the Island of God will shut down for 24-hours. It reminds us to always remains quite and in peaceful rhymes. A day before Nyepi Day is called ‘Pangrupukan’, where Balinese people gathered in the street and the celebrations are enlivened with ‘Ogoh-Ogoh’ parade. Ogoh-Ogoh is a demonic statue made from bamboo and paper, it reflecting malevolent elements and at the end of the parade; all of these evil spirits are driven away by burning the Ogoh-Ogoh. The day after Ogoh-Ogoh parade is called Nyepi Day – Silence Day – All the public places are closed, no transportation is allowed, everyone must be stayed at home and not allowed to do some activities, even to work, travel or go outside their home. Lights and sounds will remain off. All of these rules must be obeyed by all people who happen stay in Bali, with no exception. 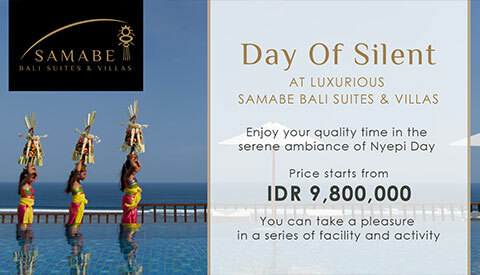 Embrace the serenity of Nyepi Day at Samabe Bali Suites & Villas, if you are happen to travel to Bali during Nyepi period, Samabe Bali Suites & Villas offers perfect getaway to enjoy the tranquility Nyepi night in Bali. Experience the 2 nights stay in one of well-appointed luxury villa or suite, make your Nyepi stay more festive with number of inclusions. Starting from a lavish selection of daily breakfast in Rempah-Rempah Restaurant, daily free flow non-alcohol beverages, daily afternoon tea completed with various bites to accompany your leisure time, and one time lunch and dinner on Nyepi Day. The luxurious 2 nights Nyepi getaway can be purchased with price starting from IDR 9,800,000++ for 2 adults, this promotion only valid for guest who will check-in on 16th of March. For more information and reservation, please send email to mail@samabe.com or visit www.samabe.com.